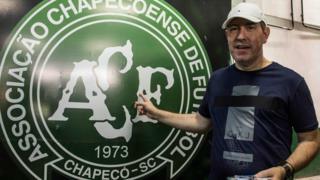 Brazilian journalist Rafael Henzel, 45, collapsed while playing football with friends on Tuesday. He was taken to hospital but died shortly after. Chapecoense described him as a "symbol of the club's reconstruction". A highly respected journalist, Henzel returned to his job at a radio station in the southern city of Chapecó after recovering from the 28 November 2016 crash. "Throughout his brilliant career, Rafael told the story of Chapecoense," the Chapecó club said in a tribute on its website (in Portuguese). "The green and white pages of this institution will always remember his example of overcoming [adversity] and everything he did." Henzel was scheduled to cover the match between Chapecoense and Criciúma for national tournament Copa do Brasil on Wednesday. Chapecoense has asked Brazil's football association to postpone it. "When we were 10-15 minutes away from landing, the engines went off because the plane had ran out of fuel... I put my seat belt on and I thought that the engines would go back in a few minutes. But that didn't happen." "My dream was to come back to my city, feel the ground under my feet. And this finally happened. It was a very special moment," said the journalist, who published a book about the crash in 2017.